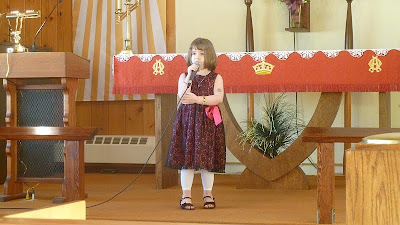 Here's a little girl in our church belting out a song. This kid - trust me - is NOT shy. Distant swans on the lake. Maternal Matilda licking her older calf Pearly (taken through a window, so not the sharpest). Full moon through some clouds. Snap assuming the obligatory rooster pose. More mommy love. Matilda is simultaneously licking Pearly and nursing Thor. Making pizza (last night's dinner). ...as well as the roof of the greenhouse. Are those tundra swans?? We get those guys coming through around Thanksgiving time on their way "south" (they summer around the Arctic Circle and winter in Vermont, which they consider "flying south for winter"). I love them. So do the birdwatchers. The images of Matilda and Pearly really are quite moving. And those reflections! Tundra or Trumpeter? Inquiring minds want to know. I thought we might hear some of that little girl's vocals, but I guess that's not easy to do? I dunno. Shrugs. Has she got tattos or is my laptop screen dirty? It's so sweet to see Matilda caring for both of her offspring simultaneously - such a good mom! Pretty pix. That Snap sure turned out to be a handsome rooster. Hard to believe he was just an egg not that long ago. I feel so old. Sigh. Tundra swans, and a temporary tattoo. You sure know how to make that lifestyle of yours idyllic. I know it's no more so than most but you do a good job. I know I can look at the rough stuff of the world going on and you got a little slice of peace over there. Thanks for posting. Love the ice cream post you did next too. Got you blog rolled on my site. I am a fan of Snap. A cockey unruley Rooster is something that is digging up bones for me. Too bad for Snap that he is probably going to come to a unhappy end. Trust me I know. Matilda sure is a good cow. I can't believe Pearly's so big and Jet's calving! I love looking at Matilda. My Uncle had a Dairy Farm and it was heaven on earth. I love the smell and the faces of each and every cow he had. They were so beautiful. As a treat we got sips of fresh warm milk in the milk room while it was swishing in a huge vat. Such good memories come to me when I look at your lovely pictures of Matilda.